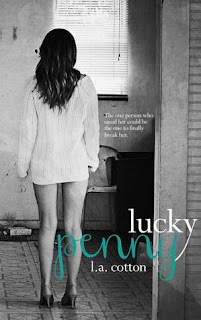 At 12 years old, Penny Wilson lost her parents in a tragic car accident. Her whole world was shattered. Everything she knew and loved was gone. With no family to take her in she is sent to the Freeman House foster home from hell. Scared and alone, Blake Weston (another foster kid) takes her under his wing and gives her a reason to fight. He becomes her light in this dark and ugly place. She becomes his Lucky Penny. They quickly become best friends and later grow into first loves. Blake makes a point of doing little things for Penny like making her Birthday cards and surprising her with treats at their secret place, No Mans Land. One day Penny comes home and Blake is gone. No note and no one will tell her where he went. Fast forward and Penny's now 23. Full of scars from her past and just trying to make it one day at a time. In hopes of healing and on the recommendation of her therapist she applies for a summer job at Camp Chance. A camp that allows foster children a chance to be kids, have fun and heal. Penny hopes she can heal too. What she didn't expect was to run into Blake and the tsunami of feelings that return with him. Tissues are necessary for this read as the author delves into deep emotional issues. I found myself immersed so much that I didn't want the book to end. I look forward to reading more from this author.